Typically when I think of dessert in the summer, I think of ice cream and popsicles- definitely not a bad option. Ice cream is personally my favorite dessert, but sometimes a special occasion may call for something a little more elegant. Yet, who wants to use their oven when it is over 90 degrees outside? I’ve compiled a few dessert ideas that are delicious and yet require no oven! These are some great ideas for those events you have coming up this summer that you want to make desserts for, but don’t want to heat up your house! 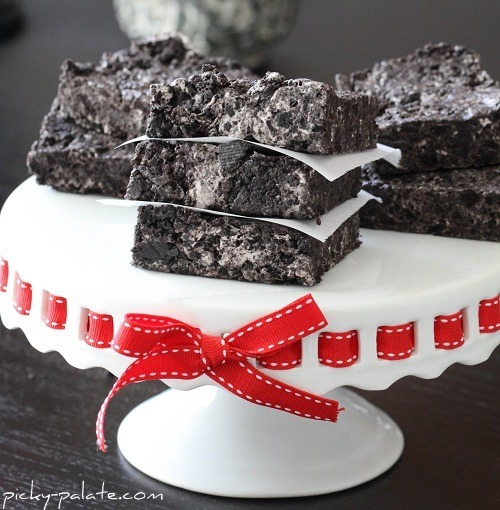 No-Bake Chewy Cookies and Cream Bars (Recipe is included below). - these are basically a glorified Rice Krispie treat. But it has Oreos. I don’t know about you, but I’ll use any excuse to eat more Oreos! My sister also tried these with Nutter Butters. Really you could experiment with all kinds of cookies and cereals! Or turn them into S’mores bars by substituting Golden Grahams for the Oreos and adding chocolate chips! No Bake Cookies- an oldie but goodie. Who doesn’t like these? You could even try some variation by using dark chocolate, Nutella, adding chocolate, white or butterscotch chips- this one idea could easily take you through the whole summer! Popcorn Cake- Sydney has written an article about this recipe here. You could also use food coloring with marshmallow and make festive popcorn balls. Or use pudding mix (lemon, butterscotch, white chocolate) for a very addictive dessert. Sydney has the recipe for you here. 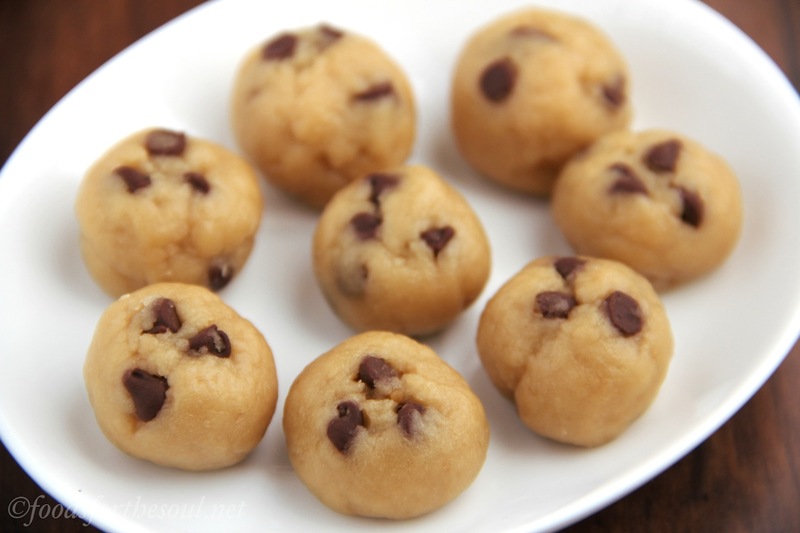 Cookie Dough- okay, some people may not see this as a dessert, but if you just have a craving for something sweet, this could definitely satisfy! Just be sure to make an eggless version to avoid salmonella poisoning (I have included an eggless recipe below). 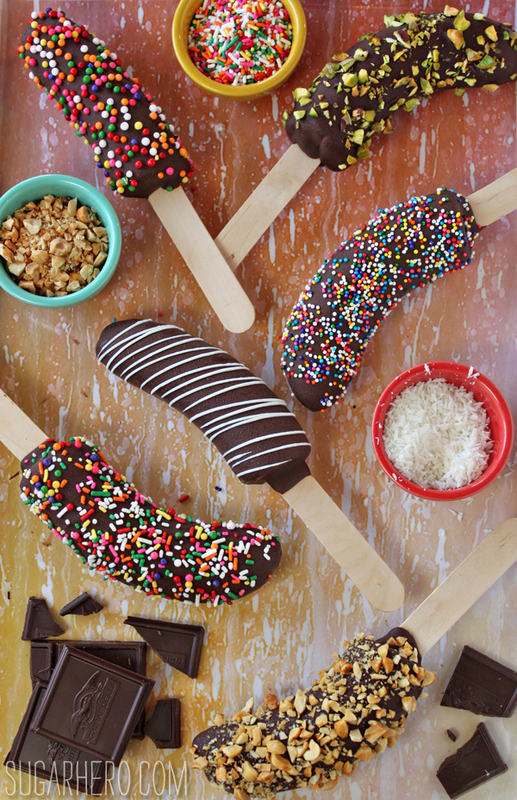 Chocolate-Dipped Frozen Bananas- this could be a fun summer activity by letting children or guests make their own! Just have the dipping chocolate and bananas ready and provide all sorts of yummy toppings (sprinkles, chopped nuts, chocolate or peanut butter chips, raisins, Reece’s pieces, coconut flakes, etc.). Just stick a Popsicle stick in your peeled bananas, freeze for an hour on a baking sheet lined with parchment paper, and then dip them in your chocolate and toppings. You can eat these right away or put them back in the freezer in an air-tight container. The site where I found this said she preferred eating hers when they had been sitting out for 10-15 minutes, because then they were nice and creamy- sounds good to me! Chocolate-Dipped Anything! While we’re talking about chocolate, you could make anything a little fancier by dipping it in chocolate! Strawberries, Oreos (again, any excuse is a good one to me! ), raisins, etc. It would be so easy to take something plain and make it into something special! 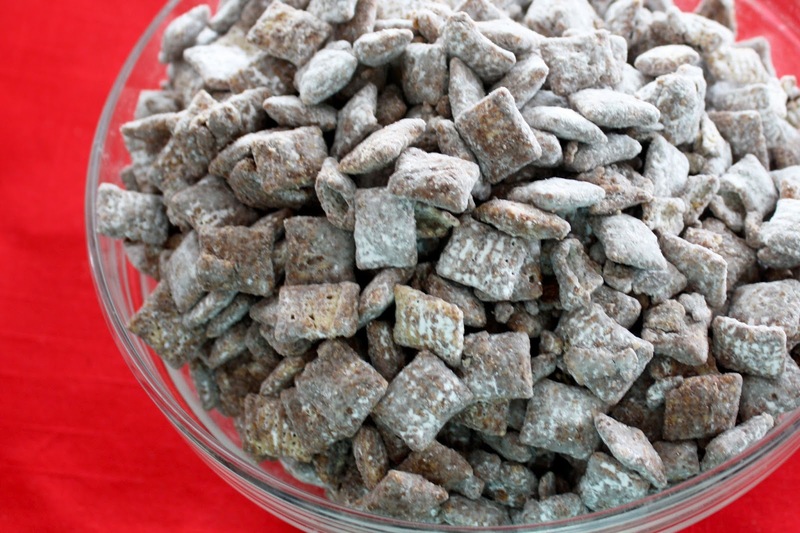 Muddy Buddies- another classic, but something so easy and no baking required! This is another recipe that could take you through the whole summer because there are so many variations you could try! I know there’s tons of no-bake deliciousness you could concoct this summer. 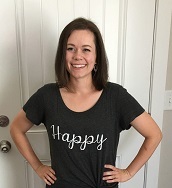 Hopefully this article sparked some fun and delicious ideas for your family! In a large bowl, beat butter and sugars with an electric mixer on medium speed until light and fluffy, 2 to 3 minutes. Mix in milk and vanilla. Stir in flour and salt and mix on low speed (or by hand) until incorporated. Stir in chocolate chips. Dough can be eaten immediately or stored in an airtight container in the refrigerator for up to 3 days. A quick and easy recipe that is perfect for those days you want something sweet without using the oven! Melt marshmallows and butter in microwave until puffed, about 1 1/2- 2 minutes. Remove and pour in ground Oreo Cookies. Stir to combine then transfer to a foil lined 8×8 inch baking pan. Let set up for 10 minutes. Remove bars out of pan with edges of foil and cut into squares.